As every carnival should be, full of colour and spirit! 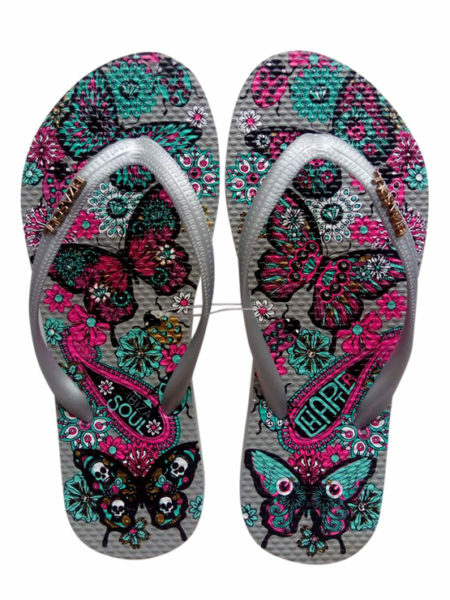 These amazing flip flops encapsulate the love and fiesta that is summer in Ibiza. Scott Gray aka Chapter is an artist and DJ. His art has been described as pop-gothic, using brightly coloured and decorative images, juxtaposing them with designs that celebrate the beauty of life and nature. 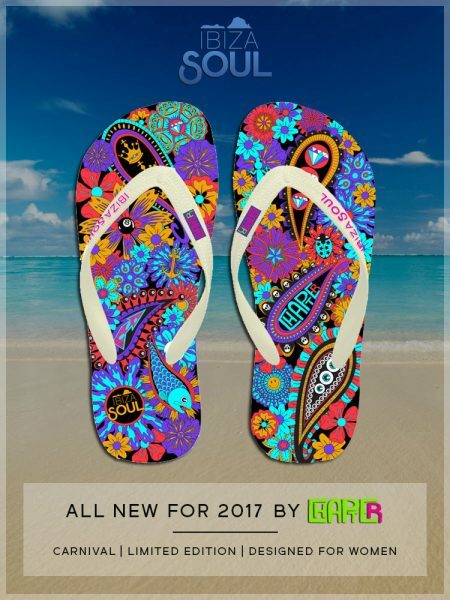 New for 2017 he has been working with us to develop 2 limited edition designs for women that launch this summer. All our flip flops come equipped with a soft toe column to reduce toe irritation & front plug washer to reduce blow outs. Cala Tarida is the longest and widest beach of fine white sand on the island’s west coast. Famous for her beautiful blue, turquoise and emerald green waters and amazing sunsets. 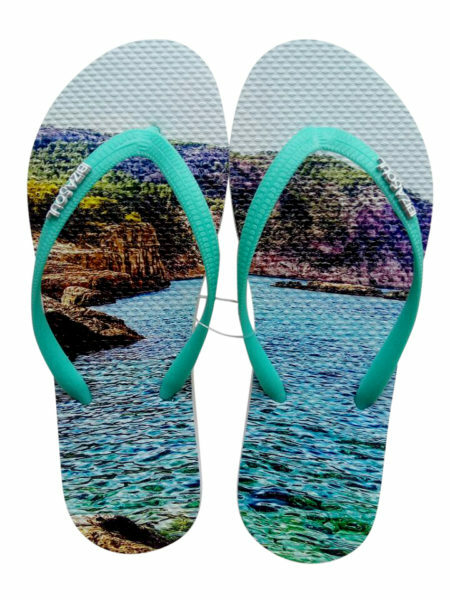 So the next time you find yourself missing Ibiza just slip on your Taridas - You wont feel the sand between your toes but our flip flops are the next best thing! Printed on soft, comfortable, durable rubber. Thin white strap with light pink metal logo. Set against the back drop of turquoise waters and white sands, Cala Bassa Beach is clearly one of the best beaches on the island, feet down! Printed on soft, comfortable, durable rubber. Slim width white or yellow strap with turquoise logo. All our flip flops come equipped with a soft toe column to reduce toe irritation & front plug washer to reduce blow outs. Who doesn’t like a sunset? Ibiza has some of the best and this one in particular was shot from our sister island Formentera. If you look closely you can see the outline of Es Vedra on the left flip flop. Sunset Ibiza Soul flip flops are the perfect companion to transition seamlessly from day to night. Printed on soft, comfortable, durable rubber. Slim width fluro pink strap with white logo. All our flip flops come equipped with a soft toe column to reduce toe irritation & front plug washer to reduce blow outs. Venturing out onto a jetty in Ibiza generally means one of two things. An imminent dip in the enchanting turquoise sea or the beginnings of a nautical adventure to one of the island’s secret destinations only accessible by sea. The choice is yours.. Printed on soft, comfortable, durable rubber. Slim width fluro green strap with white logo. 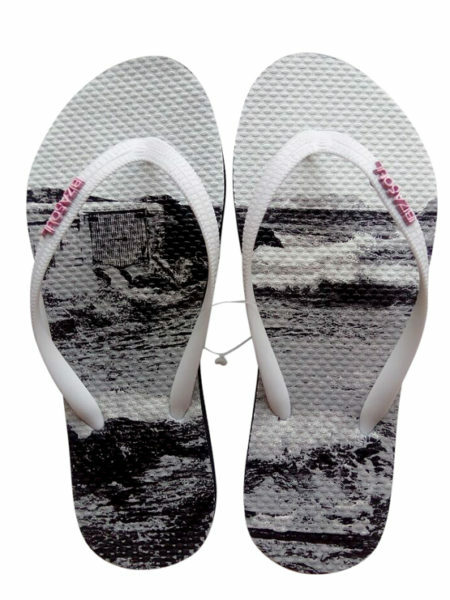 All our flip flops come equipped with a soft toe column to reduce toe irritation & front plug washer to reduce blow outs.